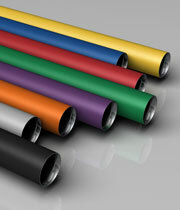 True Color EMT is available in 8 vibrant colors to provide instant identification of multiple circuit systems. The colors can separate fire alarm circuits from power wiring, data com cables, and eliminate the unnecessary labor of applying spray paints, powder coats, or tapes in the field. Columbia-MBF’s True Color electrical metallic tubing (EMT) is precision manufactured from high grade mild strip steel for exceptional durability and long-lasting life. True Color EMT is hot galvanized using a patented inline Flo-Coat process. This process combines zinc, a conversion coating, and a clear organic polymer topcoat to form a triple layer of protection against corrosion and abrasion. True Color EMT is made from E-Z Pull EMT which combines strength with ductility, providing easy bending, cutting and joining while resisting flattening, kinking and splitting. Available in trade sizes 1/2 (16) – 4 (103). True Color EMT (Electrical Metallic Tubing) has a special low friction ID coating called E-Z Pull that greatly improves the slip properties between conduit and wire. With E-Z Pull EMT, wire pulls through the EMT smoothly and easily, making installation easier and faster. Columbia-MBF’s True Color EMT is very effective in reducing electromagnetic field levels for encased power distribution circuits, shielding computers and other sensitive electronic equipment from the effects of electromagnetic interference. For more information, visit GEMI (Grounding and Electro-Magnetic Interference) software analysis program. Columbia-MBF EMT is certified to Canadian Standards Association C22.2 No. 83.1. As a metal raceway, EMT functions as an equipment bonding conductor when installed in compliance with the Canadian Electrical Code (CEC), including Section 10 Grounding and Bonding and Section 12-1400 Electrical Metallic Tubing. Documentation is available in the GEMI (Grounding Electro-Magnetic Interference) analysis software and related research studies. To specify Columbia-MBF True Color EMT, include the following: Electrical Metallic Tubing shall be equal to that manufactured by Columbia-MBF Inc. True Color EMT shall be hot galvanized steel O.D. with an organic corrosion resistant I.D. coating, and shall be CSA Certified to Standard C22.2 No. 83.1 and manufactured in accordance with ANSI C80.3. 1Outside diameter tolerances: +/- .005 in. (.13mm) for size 1/2 (16mm) through 2 (53mm); +/- .010 in. (.25mm) for size 2-1/2 (63); +/- .015 in. (.38mm) for size 3 (78); +/- .020 in. (.50mm) for size 3-1/2 (91) and 4 (103).